While winter is still present, have your free time to learn how to cook what to accompany your most appreciated bottles! 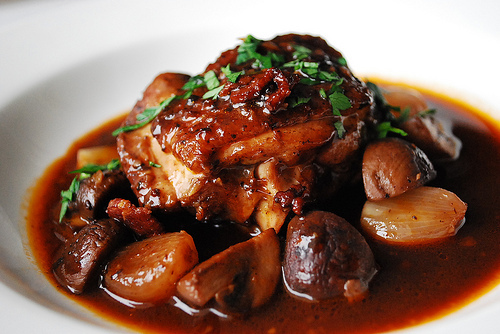 Today, we offer for the first time on DIVA CHINA a Food Pairing article to accompany your Coq au Vin with a Côtes du Rhone! Romans brought the vines culture in the Rhône Valley two centuries ago; sailing up the river, they discovered, on each sides of the river, a great diversity of soils and climatic conditions very favourable… The river itself has sculpted hillsides and plains, bringing from the Alpes Mountains, silt and round pebbles. 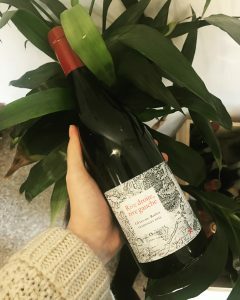 Since this time, men have cultivated the best soils to elaborate beautiful cuvees of Côtes du Rhône like this one, descended from the “terroir” of Signargues, with great Grenache, juicy Syrah, cinsault and mourvèdre, full of charms, fruit and sweet spices! This wine composed of Grenache 70% Syrah 10% Cinsault 10% Mourvèdre 10%, traditionally vinified in tank can be enjoyed with this french Coq au Vin Recipe ! – The due day: drain the pieces of rooster and vegetables, sponge them well and filter the marinade. Reserve. – Heat the oil in a casserole, throw the pieces of rooster and leave them to brown on all faces. – Remove them from the casserole when golden, put the vegetables instead. Let them heat for 5 minutes. Spinkle with flour, and put aside the vegetables. – Put the rooster pieces back in the casserole, add the crushed garlic cloves. – Then, heat the cognac, pour it and blaze. Wet everything with the wine marinade, add the chicken stock, salt and pepper. Boil, cover, and lower the heat. – Simmer 2 1/2 hours over low heat. – Slices the mushrooms, cook them in a frying pan until brown with the bacon for about 5-10 minutes. Add them in the casserole 15 minutes before serving. – Taste and adjust the seasoning.